Let me just start off by saying that I'm a newbie to the International Spa Association's (ISPA) Conference and Expo, but the organization's 25th anniversary event was the perfect introduction to the benevolence and innovation that is happening within the spa industry. 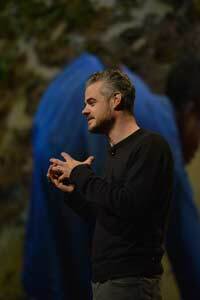 Held on Oct. 19-21, 2015, at the Mandalay Bay Convention Center in Las Vegas, the 25th ISPA Conference & Expo was able to make attendees laugh and cry, sometimes during the same presentation, but the common sentiment was inspiration, as attendees left with dreams of what can happen in the spa industry—and their own spas—in the next 25 years. The theme for the conference was "Explore," which was chosen to represent the pioneers of the past and those of the future. Michael Tompkins, ISPA's board chairman, opened the first general session by welcoming attendees and recognizing them for the change they had made. Boldijarre Koronczay, founder of Éminence was then presented with the ISPA 2015 Visionary Award. Koronczay thanked his family, including his brother and general manager Attila; his fellow ISPA members and the people at his company. Pamela Peeke, M.D., then helped attendees center themselves by meditating for stress reduction. The event's keynote speaker Randi Zuckerberg, founder of Dot Complicated and former director of market development for Facebook, then presented her top 10 tech trends for 2016. 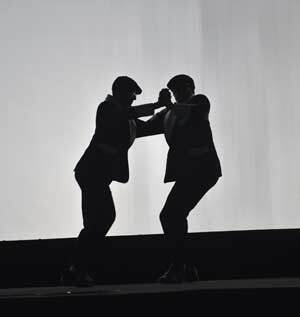 The general session then ended with what appeared to be a dance by Tompkins and Koronczay. Attendees were later surprised when the dancers were revealed to be doubles, and Tompkins and Koronczay joined in on the fun in matching tuxedos. The second day of the general sessions opened with a snapshot of the spa industry by Colin McIlheney, global research director for PricewaterhouseCoopers (PwC). He highlighted a few key metrics on the U.S. spa industry: 20,660 locations; 360,000 employees; 176 million spa visits and 15.5 billion in revenue. He was optimistic about the future of the spa industry noting, "All the key nummbers are on an upward trajectory." ISPA foundation chair Jeff Kohl then recognized all of the changes he has seen in the past 25 years and how ISPA has been his family. He awarded the Mary Tabacchi Scholarship to two deserving esthetic students: Taylor Toreno (Florida Gulf Coast University) and Anne Liise Verpson (University of Tartu). 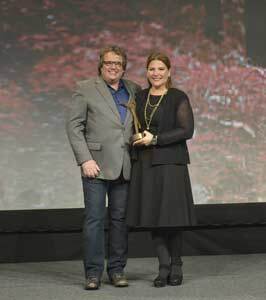 He then introduced incoming chair Frank Pitsikalis, who presented the ISPA Dedicated Contributor Award to Sahrilyn Abbajay, senior vice president of operations, brand development and retail concepts for Elizabeth Arden Red Door Spas. She encouraged attendees to "devote yourself to a cause that means something to you" and "let the moment seize you." 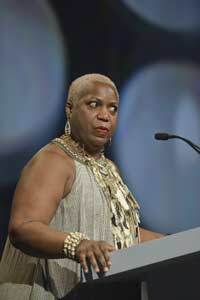 Attendees were then briefly awestruck as sociologist Bertice Berry took to the podium and began crooning Oleta Adams' "I had to hear your voice" with such power and depth that you would swear it was Adams herself. She then began to tell a story of her encounter with "Malibu Barbie" that had attendees rolling with laughter until the point they realized that the story was about self-love. She described her feelings of inadequacy standing next to "Malibu Barbie," only to later realize that the statuesque blonde was standing next to Barry due to her own feelings of inadequacy, hoping that some of Barry's confidence would transfer. She ended with an emotional call to attendees to feel their own self-worth and believe in themselves as strong, beautiful individuals, noting that everyone "deserves goodness." The inspiration continued with Amy Purdy, 2014 Paralympic bronze medalist and former esthetician and massage therapists. She told the story of how she lost her legs and wondered how she would ever travel the world and be able to tell the stories she dreamed about. Rather than letting her circumstances defeat her, she chose to use her her circumstances to her benefit. She noted, "Choose to look at your challenges as stepping stones and yoru obstacles as opportunities." She concluded, "My legs haven't disabled me. Believe in the possibilities." The general session on the third day began with Tompkins, who introduced Deborah Szekely, founder of Rancho La Puerta. Szekely was charged with bestowing the Alex Szekely Humanitarian Award on behalf of her late son Alex to Alice Waters, chef and founder of Edible Schoolyard Project. Waters honored Alex Szekely as a a “true visionary,” and she related her food activism to the spa industry by recounting an experience she had at a hammam in Turkey. She was presented with a healthy apple after bathing at the spa, and she realized that simple choices allow us to be healthy from the inside-out and the outside-in. Scott Harrison, founder of charity: water, followed Waters with a storyline of success. He brought attendees along a timeline from his club-promoting days to how he came to realize a worldwide lack of clean drinking water. Harrison told the story of Letikiros, a woman who after dropping her family's water for the day after she had spend hours retrieving it, took her own life out of shame. Attendees were moved by the sorrow and sickness that plagues those drinking dirty water, but they were overjoyed to learn of the stories of triumph, thanks to charity: water's success in bringing wells to a number of communities. In one story, Harrison describes a woman named Helen who after receiving clean water for the first time, finally described herself as beautiful. Now that her village had enough clean water, she now had water to bathe and beautify herself. Harrison motivated the crowd to take action and start their own campaign for clean water. Although he has brought over six million people clean drinking water, the world still has over 600 million people drinking dirty water. Apart from the conference, ISPA's Conference and Expo also had a showfloor buzzing with new product launches and the latest in treatments and techniques. There were nearly 220 exhibitors, each with their own contribution to the spa industry. Some of the expo's notable products launches included: Eminence's VitaSkin Exfoliating Peels, LightStim's Photomasque and Photoserum; Pevonia's Stemcells Phyto-Elite Intensive Body Corrector, SpaRitual's Yuzu Rose Collection, Youngblood's Contour Palette, Dr. Dennis Gross' Alpha Beta Ultra Gentle Peel, Elemis' Pro Radiance Illuminating Flash Balm for Breast Cancer Care, Jurlique's Limited Edition Rose Hand Cream, Jane Iredale's In the Blink of a Smoky Eye Smoky Eye Kit, FarmHouse Fresh's Plum Chiffon and Marshmellow Melt All Purpose Balms, and many more. Downstairs near the general session, the Relaxation Area featured brand-sponsored suites, many set-up to be tranquil mini-spas. I had the opportunity to experience a few treatments offered in the Relaxation Zone. My first facial treatment in the relaxation zone was with Thalgo. Upon entering the mini-spa, I was offered one of their organic herbal teas. Being that we were at a tradeshow, I chose their Light Legs variety, a berry infusion that promotes circulation to reduce heavy legs. I wanted to try something new and was given the company's i-beauty treatment. Following a cleansing, the skin is exfoliated with sound vibrations technology to exfoliate and purify. Ultrasound is used to drain, infuse and stimulate. The application of hyaluronic acid using the tripolar radiofrequency technology restores the skin’s plumpness and firmness. My complexion was noticeably more youthful, even after one treatment. I also experiences Phytomer's XMF Youth Revealing Express Facial, a youth restoring experience featuring marine biotechnology ingredients and the company's Pro Youth Massage for instant, visible anti-wrinkle and firming results.You may be wondering what a pro-youth massage is exactly. Well, after deeply cleansing the skin, the therapist does a thorough facial and décolleté massage using massage roller and face shaper tools designed by a French osteopath. The roller smoothes features and diminishes lines by stretching and toning the tissue, while the shaper mobilizes muscles and works on specific wrinkles. The treatment utilizes the company's Extra Marine Filler (XMF) technology, a marine sugar produced by a plankton microorganism that instantly smoothes wrinkles while stimulating collagen, elastin and hyaluronic acid production. Other companies with Relaxation Area suites included: SpaRitual, Colorescience, Babor, Comfort Zone, Decleor, Dr. Dennis Gross, Dr. Hauschka, FIT Bodywrap, and Sanitas. ISPA's Conference and Expo will be at a new location in 2017, at The Venetian in Las Vegas. It will take place Sept. 13-15, 2016, and the opening keynote speaker will be scholar, author and popular TED Talker Brené Brown.